NEC Display Solutions of America is releasing its fourth generation of video wall products, for organizations deploying displays for 24 x 7 use in a variety of digital signage, corporate and broadcast video wall applications. Like their predecessors, the 55-inch X554UNS, the 55-inch X554UN and the 46-inch X464UN are direct LED-backlight LCD displays, which allow for improved brightness uniformity, reduced power consumption and mercury-free components. The UNS model now minimizes that distance to a mere 3.5mm while the UN displays have a bezel gap as low as 5.5mm. 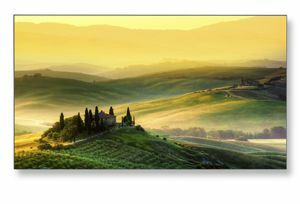 With DisplayPort 1.2 multi-streaming, they are capable of delivering ultra-high definition resolutions across the entire canvas of displays comprising the video walls. In addition, Auto TileMatrix features allow a user to simply set up the size of the video wall on the first display and automatically scale the content through the remaining displays. With the press of a few buttons, the entire video wall is set up. “Video walls are helping organizations bolster their brands in magnificent ways,” said Rachel Karnani, Senior Manager of Product Marketing for Large Screen Displays at NEC Display.